The standing ovation that filled our sanctuary at the end of the Children's Chorus Holiday Concert earlier this month may have been more enthusiastic than musical, but the message was clear: the show was an big, old-fashioned smash! Under the skilled direction of Pat Moriarity, who has an extensive background in music education, the Chorus performed a varied program that celebrated not only Christmas, Hanukah and Kwanza, but the winter season, with pieces that ranged from the ranquil to the rollicking. There were also some solo performances. Kudos to:our extremely talented ensemble: Lucas Alvarez, Larissa Brito, Audrey DePalma, Briana Gilliard, Amaris Guerra, Cassandra Gwynn, Suelin Hu, Linda Humira, Daniela Hunire, Claire Souza and Allyson Vecchia-Spooner. And what does the Chorus do for an encore? Why a Spring Concert, of course. Work on that will begin in February and there's always room for more! 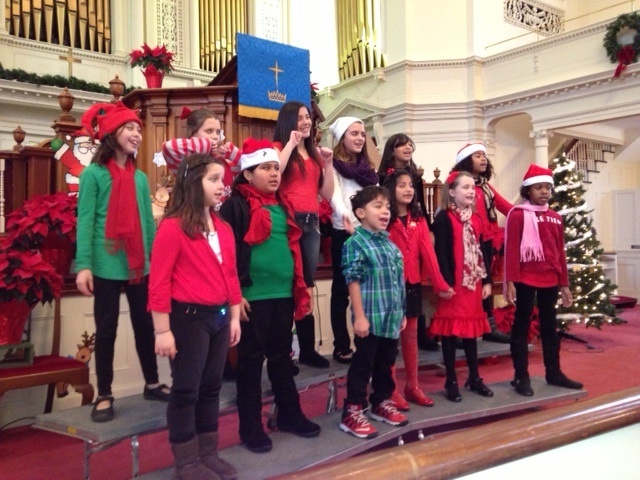 The Children's Chorus, which is non-religious and is free of charge, is open to all children Grades 2-6. For more information, call 203-744-6177.